NBA: Dwight Howard had 32 points and 17 rebounds, and the Magic withstood a career-high 50 points by Dwyane Wade to rout the Miami Heat 122-99 at Orlando, Fla.
Hedo Turkoglu had 20 points and Rafer Alston added 12 points and nine assists for the Magic, who have won 12 of the past 15 games against their Sunshine State rival. 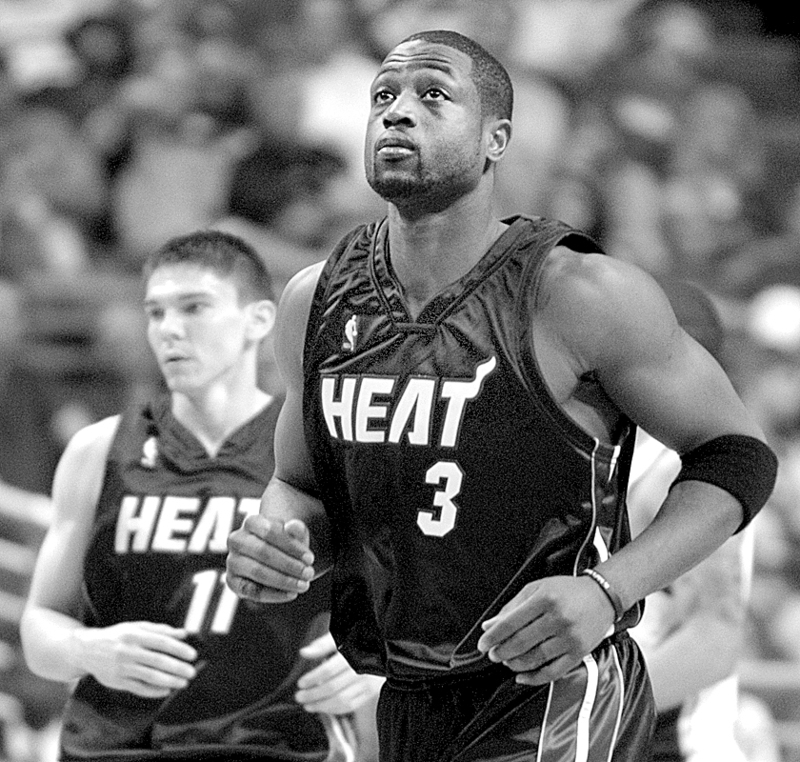 Wade was potent from inside and out, scoring with high-flying dunks and soaring jumpers that had even some Magic fans chanting “M-V-P!” Miami’s do-it-all guard had previously scored 48 twice in his career, and had 43 points two times earlier this season. •Lakers outlast Wolves: Kobe Bryant scored 28 points to move past Elgin Baylor into 20th place on the NBA’s career scoring list and the Los Angeles Lakers outlasted the Timberwolves for a 111-108 victory at Minneapolis. Lamar Odom had 25 points and 14 rebounds, and Pau Gasol added 25 points for the team with the league’s best record. •West returns to lead Cavs: Delonte West scored 25 points in his first game since mid-January and LeBron James added 20, leading the Cavaliers to a 99-78 win over the Detroit Pistons at Cleveland. College basketball: Gerald Henderson scored a career-high 35 points and No. 9 Duke held on to beat No. 8 Wake Forest 101-91 at Durham, S.C.
Jon Scheyer added a career high with 30 points for the Blue Devils (22-5, 8-4 Atlantic Coast Conference). •Villanova sweeps Syracuse: Dwayne Anderson scored a career-high 22 points to lead No. 12 Villanova to a season-series sweep of No. 24 Syracuse with an 89-86 victory at Syracuse, N.Y.
•Auburn clinches title spot: DeWanna Bonner scored 22 points and No. 3 Auburn made 9 of 10 free throws over the final 44 seconds to beat Georgia 65-59 at Auburn, Ala., and clinch at least a share of its first SEC title in 20 years. Tennis: Andy Roddick won his first title of 2009 and the 27th of his career Sunday, beating Czech Radek Stepanek 7-5, 7-5 in the finals of the Regions Morgan Keegan Championships at Memphis, Tenn.
Only Roger Federer (57) and Rafael Nadal (32) have won more titles among active players. Roddick got a bit of revenge for losing to Stepanek in the semifinals in San Jose last week and improved to 5-1 all-time against the man trying to become the first Czech to win in Memphis since Ivan Lendl in 1991. •Spaniard wins in Argentina: Tommy Robredo of Spain rallied to defeat Juan Monaco 7-5, 2-6, 7-6 (5) in the finals of the Copa Telmex at Buenos Aires, Argentina, and won his second tournament in as many weeks. Robredo won his ninth career title, including a victory at the Brazilian Open last week. •Frenchman wins in France: Jo-Wilfried Tsonga won his second ATP title of the season, edging Michael Llodra 7-5, 7-6 (3) at Marseille, France, in an all-French final at the Open 13. Tsonga won the SA Tennis Open two weeks ago in Johannesburg, South Africa. He improved his record to a tour-best 19-3. Cycling: Levi Leipheimer won his third straight Tour of California, which concluded Sunday at Escondido, Calif.
Leipheimer took over the lead in the nine-day race last Monday and never gave it up. Lance Armstrong, who began a comeback last month, spent this race in support of Leipheimer, his Astana teammate. Armstrong, the seven-time Tour de France winner, finished seventh overall. NHL: Matt Cullen had his first career hat trick and the Carolina Hurricanes extended their winning streak to three games with a 5-2 victory against the Colorado Avalanche at Raleigh, N.C.
•Harding stops Blackhawks: Josh Harding made 44 saves, and Peter Olvecky snapped a tie early in the third period with his first NHL goal to help the Minnesota Wild beat the Blackhawks 2-1 at Chicago. Winter sports: Todd Lodwick of the United States won a Nordic combined event at Liberec, Czech Republic for his second straight gold at the Nordic skiing world championships. American Bill Demong was third. •U.S. sled takes bronze: Ivo Rueegg and brakeman Cedric Grand of Switzerland won the two-man at the bobsled world championships at Lake Placid, N.Y., while the U.S. team earned the bronze. Americans Steven Holcomb and Curtis Tomasevicz earned the first U.S. medal in two-man at worlds since 1997.